Objective: To investigate the effect of specimen storage time on blood glucose level for neonates in order to avoid misdiagnosis of neonatal hypoglycaemia. Methods: (1) Five fasting blood samples were collected from 50 new-borns, with storage times of 0.5 h, 1 h, 1.5 h, 2 h, and 3 h. The serum was centrifuged and blood glucose level was measured by the hexokinase method. (2) One 8 ml Ethylenediamine Tetraacetic Acid Dipotassium (EDTA-K2) anticoagulant sample was divided into three portions of different pressure product and then mixed at room temperature in different time for glucose detection. Results: (1) Blood glucose values of the samples placed at room temperature for 1 h, 1.5 h, 2 h, and 3 h decreased significantly. (2) Higher red cell volume (Haematocrit, Hct) correlated with faster decrease in blood glucose concentration. Conclusion: Neonatal blood sample storage time has a significant influence on blood glucose level, which is closely related to the Hct level. Therefore, the detection process should be performed immediately after sample collection; if testing is not performed in a timely manner, serum should be separated to ensure accuracy of neonatal blood glucose test results. Most energy for cellular activities is derived from glucose, and more than 70% of the energy used by the human body is provided by the glucose oxidation process, which is important in maintaining the body's normal physiological functions. Thus, the blood glucose level must be maintained at a certain level to meet the demands of organs and tissues . The neonatal liver cannot store sufficient glycogen, so the brain acquire the glucose from the liver glycogen decomposition is limited, which is prone to complications such as hypoxia, infection, and others. These processes will consume significant energy and thus lead to neonatal hypoglycaemia. Earlier development of neonatal hypoglycaemia represents more severe disease, and is more likely to result in permanent central nervous system damage, such as reduced IQ and cerebral palsy . Therefore, improvements in neonatal blood glucose monitoring and clinical care are important to prevent and cure neonatal hypoglycaemia . However, in our daily clinical practice, we found that in some cases, the laboratory critical values were different with the peripheral blood glucose level, but the re-test result is the same. We also found that the sample storage time had a negative impact on the final result. This resulted in many misdiagnosed cases of neonatal hypoglycaemia due to prolonged transportation time. According to data in the literature, this is mainly due to the sample storage time [4-6]. In China, currently there is no report concerning the impact of sample transportation time on the final blood glucose result. The nurse who always ignored this process mainly implements the delivery process . In order to evaluate the correlation between Haematocrit (Hct) and neonatal blood glucose level, and at the same time improve accuracy of the results, we compared the blood glucose levels of 50 neonatal blood samples stored for different lengths of time and with different Hct levels. We utilized random sampling to select 50 neonates in the neonatal intensive care unit in our hospital from September 2014 to March 2015. We excluded neonates weighing less than 1.5 kg in order to avoid anaemia associated with the 7.5 ml blood collection. We collected 5 specimen per patient, and each specimen was 1-1.5 ml. Samples were delivered to the laboratory department immediately. Three samples that were haemolysed during the collecting process were not included. We utilized the Beckman AU5400 automatic biochemical analyser and the supporting reagent. The hexokinase method was used to detect the blood glucose level. The Xisenmeikang blood cell analyser XN100 and the supporting reagent were used to adjust the Hct. According to the parameters in the instructions and the instrument program requirement, we utilized the Beckman automatic biochemical analyser to measure the blood glucose level. The specific steps were: (1) measure the blood glucose level in one sample within 0.5 h after blood collection, and place the remaining 4 samples at room temperature for 1 h, 1.5 h, 2 h, or 3 h; (2) separated the 8 ml sample with EDTA-K2 and divide it into three specimens, then utilize the XN100 to measure Hct in the 0.5 h, 1 h, 1.5 h, 2 h, and 3 h samples. We used SPSS13.0 to analyse the data. The final result of the blood glucose level is presented as ͞x ± S; t analysis was also used. P<0.01 was considered statistically significance. The final glucose levels of the 1 h, 1.5 h, 2 h, and 3 h samples decreased compared with that in the 0.5 h sample. The blood glucose level of the adjusted Hct samples at 1 h, 1.5 h, 2 h, and 3 h were significantly decreased (P<0.01). We concluded that greater Hct was associated with a more rapid decrease in blood glucose level. The final results of the neonatal blood glucose levels at different storage times are presented in Table 1. The impact of different Hct levels and storage times on the blood glucose level is shown in Figure 1. 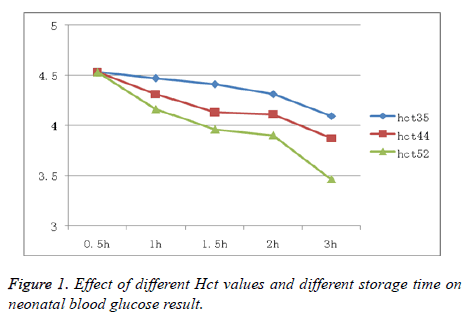 Figure 1: Effect of different Hct values and different storage time on neonatal blood glucose result. Table 1. Comparison of the effects of specimen storage time on blood glucose level (͞x ± s). As new-borns just separate with their mother, there is not enough glucogen arrangement and more consuming, lower gluconeogenesis, lack of the exogenous glucose, immature glucose metabolism regulation mechanism and other metabolism disabilities, all of which can readily lead to neonatal hypoglycaemia . As glucose is the only energy source for brain cell metabolism, neonatal hypoglycaemia will undoubtedly influence metabolism, and potentially lead to brain damage. The damage level is determined based on the severity and duration of hypoglycaemia . Currently, hypoglycaemia is monitored closely, and it is common to intervene to treat abnormal blood glucose levels in high-risk neonates. Therefore, it is important to be familiar with the parameters affecting detection accuracy of neonatal hypoglycaemia. We found that there is a difference between laboratory results and the peripheral blood glucose level. There have been some investigations demonstrating that longer storage time may lead to the diagnosis of neonatal hypoglycaemia, but no study has investigated the effect of specimen storage time on the final blood glucose level. In order to investigate the influence of specimen storage time on the final blood glucose result, we used clinical blood samples to demonstrate that there is an inverse correlation between sample storage time and the final result, indicating that longer storage time results in a lower blood glucose level. Storage time longer than 1 h will lead to a sharp decrease in glucose level (P<0.01). Furthermore, we also found that higher Hct level is associated with lower blood glucose level, which is due to the higher red blood cell mass causing increased glycolysis. The proportion of red cells in the blood is higher in neonates than in adults, and thus, storage time has a greater impact in this patient group. However, in clinical practice, especially in some large-scale hospitals, it takes time to deliver the specimen from the patient to the laboratory department [10,11]. This will result in misdiagnosis of neonatal hypoglycaemia. Based on our research, we recommend that the sample should be delivered to the laboratory department within half an hour and the centrifugation process should be conducted as soon as possible. In this study, we could not detect glucose after 3 h of storage. The specific reason for this needs to be further investigated; it is possibly due to neonatal asphyxia or some infectious disease. This clinical state could increase enzyme activity, or elevated maternal blood glucose level could result in neonatal hyperglycaemia, which will lead to the capacity of red cells use glucose decrease obviously. In conclusion, nurses should deliver blood samples immediately after collection in order to avoid the misdiagnosis hypoglycaemia. Social development project in Guizhou province Guizhou branch in LH word (2014) no. 7029. Cao A. The specimen placed time effect on blood glucose determination results. J China Mod Distance Edu Chinese Med 2010; 8: 191-192. Ding M, Zhou C. Cerebral injury of neonatal hypoglycemia. Chinas N J Pediatr 2011; 26: 59-61. Jain A, Aggarwal R, Jeeva Sankar M, Agarwal R, Deorari AK. Hypoglycemia in the newborn. Indian J Pediatr 2010; 77: 1137-1142. Niu K. Blood specimen placed time length and handling the impact on the test results analysis. Mod Diagn Treat 2012; 23: 1598-1599. Li F. About length of blood specimen placed effect on blood glucose detection. Pract Med 2001; 8: 168-169. Jia M, Gao Y. Blood storage time affect blood glucose detection. J Occup Health 2006; 22: 212-213. Shen H, Chen H. Specimen placement time and temperature on the result of blood potassium. J Nurs Sci 2011; 8. Gataullina S, De Lonlay P,Dellatolas G. Topography of brain damage in metabolic hypoglycaemia is determined by age at which hypoglycaemia occurred. Dev Med Child Neurol 2013; 55: 162-166. Vannucci RC, Vannucci SJ. Hypoglycemic brain injury. Semin Neonatol 2001; 6: 147-155. Guo Z, Yin YY. Serum separation gel technology application in the biochemical test analysis. Foreign Med Clin Biochemi Test Booklet 2003; 24: 54-55. Lin D. Vacuum coagulation in blood vessels on the result of biochemical. J Mod Hosp 2010; 10: 76-77.